ARISE Adaptive Design has grown from an idea to a movement. Follow our developing story here. Early 2016 – An Idea Becomes a Plan – Adaptive design in Syracuse made the jump from idea to reality as the team had an initial meeting to plan for a June Weekend Intensive Workshop with ADA. June 4 – 6, 2016 – Weekend Intensive Four Family Co-Design Workshop Syracuse University School of Design was the host of our three day workshop. Volunteer designers, clinicians and makers put in 12 hour work days collaborating with four families to learn, design and construct pieces of equipment to enable their children access to more opportunity. Alex Truesdell, the founder of the Adaptive Design Association, and others from the New York City team led a four hour introduction to cardboard design session followed by two full days of co-designing and building with four families. Each family worked with their own team to create a cardboard solution to their child’s design challenge. June 2016 – Pop Up Builds Begin – Garage Workshop Syracuse – Soon after the initial workshop the team got together and hosted a Pop-Up Build to follow up on the results from the initial project and incorporate new ideas. Its amazing how much you can create in a garage with friends! Adaptive design course collaboration and consultation with design teams around wearable solutions and universally designed multi-use community programming. Collaboration and consultation with student team creating multi-interface adapted driving controls for a commercially available riding toy car. Fall 2016 – Collaboration with Landscape Design program at SUNY College of Environmental Science and Forestry. ADA Syracuse teamed up with SUNY-ESF landscape design students and Syracuse Parks and Recreation to do a series of walks and talks. The Walks and Talks Project paired landscape architecture students with people in our community who have different abilities. These pairs then took walks together to talk about perspectives on the environment in which we live. The result: collaborative design ideas that will inform the building of an accessible Monday Mile walking loop near Kirk Park in Syracuse. September 20-24th 2016 – “Local/Global Adaptive Design” workshop at the American Academy of Cerebral Palsy and Developmental Medicine (AACPDM) Meeting in Hollywood, Florida. Lisa, James, and Nienke joined colleagues Jonathan Greenwood (Physical Therapist at Boston Children’s Hospital) and Shruti More (Occupational Therapist at Handimachal School, India) for a workshop on adaptive design at the 70th annual meeting of the American Academy of Cebreal Palsy and Developmental Medicine. The presentation was titled “Local/Global Adaptive Design Forum”. A FaceBook group (“Local/Global Adaptive Design Forum”) group was launched to support ongoing global collaboration. October 6, 2016 – Ithaca College Department of Occupational Therapy: Lisa met the ADA NYC team presenting professional development for occupational therapy clinical fieldwork supervisors titled, ‘Learn to Prototype Adaptive Equipment: Think Outside the Cardboard Box’. This workshop focused on thinking creatively when dealing with challenges to access in all parts of life. Since we saw them last ADA created table-top models of a variety of designs to bring on the road, a traveling adaptive design idea kit. Really smart! October 24 & 25, 2016 – Adirondack Assistive Technology Expo: Lisa and Nienke gave two presentations. One was on Adaptive Design Thinking and Cardboard Construction and the other was on Adapted Sport. This gave the groups of mostly physical and occupational therapists exposure to ADA Syracuse’s approach to cardboard co-design and the goals and initiatives of the Fitness Inclusion Network. 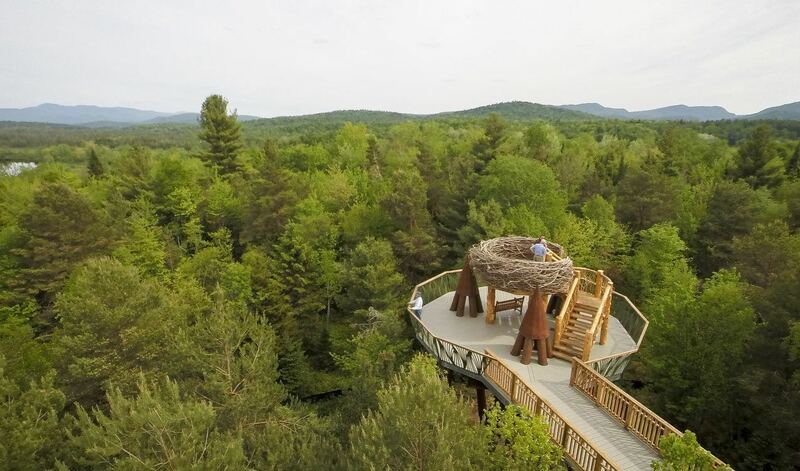 The conference hosted by Clarkson University took place at the Wild Center in Tupper Lake, a beautiful nature center with an accessible trail across the treetops. Connor Mcgough joins the SU School of Design as an instructor. January, 2017: Rocker Build Series: ADA Syracuse piloted a different format for the cardboard builds. Instead of completing a design during an all-day session, or an intensive weekend, we planned a series of workshops. Our goal was to build rockers for three children who have movement limitations and vision impairment/blindness. The rockers are designed to provide the seating recline needed by each individual and to capitalize on their ability to move. We got together for 2-3 hours at a time on three different occasions. At the first session we precut sides and seats to kids measurements. At sessions 2 and 3 we worked with families to best fit the rockers to each child. Families took home the rockers between the workshop sessions and designs were adjusted based on their feedback. This allowed us to try out a concept called parametric design, where adjustments are made to a basic design in order to meet the specific needs of a child. January 16, 2017. We met at Monica’s schoolhouse to pre-cut rocker sides and seats. January 20, 2017. This build was hosted at the Arise community room on James Street. Arise Inc is our regional Independent Living Center. Therapists, families and community members all worked together to assemble the rockers. The team employed a parametric design approach to customize the seat insert for each child, using basic templates that we had cut out earlier. Based upon the children’s individual needs, the team changed dimensions of the design to customize the rocker for each child. January 27th 2017 – This build took place at the Kinney Performance Center at Golisano Children’s Hospital. We had a potluck dinner, followed by a workshop to edge and finish the rockers and to create adjustable lateral supports and a tray system for two of our young rockers. #ParametricDesignMakesSense! Feburary 4 2017: Nienke and Jesse gave a presentation at the New England Global Health Conference for Trainees at Harvard Medical School: Building Leadership in Global Health Equity. The presentation was titled, “Local/Global Adaptive Design” and a portion of it included input from occupational therapist Shruti More at the Handimachal School in Northern India (via Skype). The talk introduced a crowd of nearly 200 medical students, residents and physicians to cardboard construction and the work of ADA Syracuse. Feburary 9, 2017 – Road Trip to Weedsport Junior/Senior High School: Some members of ADA Syracuse and Arise Inc. traveled to Weedsport Junior-Senior High School to meet with Principal Brett Fingland and Technology Teacher Alicia Bower. They have put together a team of 6 students in grades 7-11, who are interested in adapted design. The school has access to multiple 3-D printers and a 3-D scanner and is hoping to extend ADA Syracuse to plastics. Their first project was adaptive grip for gardening tools, tangible symbols, and a type of hinge that can be used with the cardboard rockers. February 22 2017 – Adaptive Ski Pole: Nienke saw a patient who was two appropriate ski poles away from skiing down the slopes. She linked up with Professor Don Carr who met with the young man a number of times and designed a set of pole handles that worked well with his hands. March 3, 2017 – Introduction Build at Upstate Physical Therapy School with high school students enrolled in the BOCES program. This was a collaborative effort with Don, Peyton, Jesse, Teri, Nienke, and Natalia, plus Beth, a medical student who had participated in an earlier build and was eager to do more. We ran a workshop for a BOCES program operated through SUNY Upstate Physical Therapy Program. These students, who have aspirations to go into a variety of health care professions including physical therapy, occupational therapy, music therapy, speech and animal medicine, learned about ADA Syracuse, how custom designs often suit children better than industrial produced products and why cardboard is such a good material to work with. It was a great interdisciplinary learning experience. March 2017 – Golisano Kinney Performing Arts Center Early Intervention teacher and adaptive designer, Teri Smith, joined Jesse and Nienke to make a rocker with the family of one of Nienke’s patients. Using measurements taken previously during an office visit and the design improved through previous builds and workshops, the rocking chair was cut and assembled in less than two hours. Toward the end Mom got in on the fun and helped in both the construction and the assembly. Jesse is a bridge between Nienke’s clinical practice and Syracuse ADA. He now meets with families and therapy teams on a regular basis, right across the street at the Kinney Performance Center. In addition to being an experienced builder, he also helps families and therapy teams with paperwork for durable medical equipment. March 17, 2017- OT/PT Staff Development Workshop St. Lawrence & Lewis County BOCES: Monica, James and Lisa took the show on the road to the New York North Country presenting the one day workshop Adaptive Design Thinking and Cardboard Construction, Syracuse ADA. SLLCBOCES occupational and physical therapists work with students ages 2-21 years across 18 school districts in this rural area. They brought great energy to the workshop! Diving into the ADA Paper Laptop Stand Challenge, modifing the ADA Circletime Bench to tip forward for a little movement while sitting, creating a concept for a floor sitting rocking spot and designing a prototype of a walk-in-sit-to-stander for use by a young woman who loves to cook with her mom. Look for innovations in the use of cardboard coils and more from this group! #GreatCardboardIdeasAreEverywhere! March 18, 2017 – Spina Bifida World Congress, San Diego, Ca – Nienke presented a talk on cardboard equipment solutions for toddlers with spina bifida within the context of “community-centered spina bifida care”. Eli’s parents talking with Brett Fingland, the Principal of Weedsport Junior/Senior High School while students take measurements for the tray attachment. April 11, 2017 – Arise Dinner/ Recognition of ADA Syracuse – Alex Truesdell was featured as the keynote speaker at the 2017 ARISE Foundation Dinner. She spoke about adaptive design and how Adaptive Design Association Syracuse fits into the larger movement. April 12, 2017 – Community Meeting – A meeting between community members, representatives from local foundations, ADA Syracuse members and Alex Truesdell took place at the SU School of Design Warehouse in Downtown Syracuse. There a recap of past steps as well as future plans of action were discussed. April 12, 2017 – Tour of WestRock Cardboard Plant – Don, Nienke, Connor and Jesse went on a tour of the Camillus WestRock corrugated packaging plant. WestRock produces corrugated cardboard, similar to the cardboard used for adaptive design and 100% of the paper that it produces is recycled material directly from the mill. June 2017 – ADA Global Meeting – Three members of the ADA Syracuse team traveled to New York City for the first ever Adaptive Design Association global conference. Members from teams ranging from Oregon to Scotland met and discussed progress that they had made along with future plans to provide creative solutions to members of their communities. June 27th 2017 – Home Depot Build – Almost a year after the initial build, the team organized a build with support from Home Depot Dewitt. Along with novel construction of two sets of stairs for local families, we continued work on rocking chairs, iPad holders and standers. Community members passing through were also invited to stop and participate in construction, finishing and painting of projects. A special thanks to Home Depot Dewitt for an abundance of materials, providing space to use those materials and support to keep this initiative going! July 22 2017 – ARISE and Ride at the farm Event – ARISE & Ride at the Farm is an annual cycling and festival event attended by cyclists and families across Central New York. Adaptive Design Association Syracuse set up a booth to demonstrate to members of the community some of our past projects and to spread the word about adaptive design. Say hi to Tracy, AAD’s new fabricator! We are so excited to have him as the newest (hired) member of the team. Look at these crazy looking guys, all ready to plash some paint on our new workshop downtown last week!